Rookie tight ends. They are the temptation that every well-versed fantasy head has learned to eschew (in redraft, at least). Largely due to the complexity of the position, most TEs fail to make an immediate impact their first season in the pros. Sure, Rob Gronkowski (TE12 in 2010) and Evan Engram (TE5 in 2017) were exceptions to the rule, but the overwhelming majority of prospects struggle to put up numbers in year-one. Second-year players at the position, however, often experience a colossal surge in production … which is exactly why you need to be aware of this year’s best prospects. In an effort to keep you ahead of the curve, here’s a snapshot of the top-three TEs in the 2019 NFL Draft. After all, they may be the key to winning a trophy in 2020. Fun Fact: Boyfriend of former Miss Iowa Teen USA, Carley Arnold. 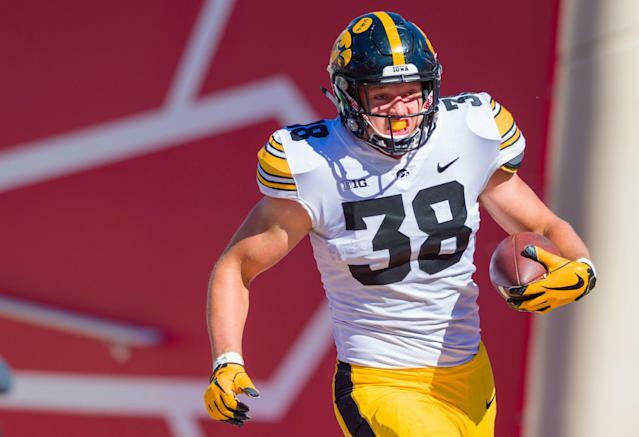 Claim to Fame: A modern-day Y tight end, Hockenson has the quicks to beat linebackers (4.7) and the size to test safeties (6-foot-5 and 251 pounds). A physical player with an advanced blocking technique, the 21 year old additionally dominates as a pass-catcher. He’s a knowledgeable route runner who can track and high point the ball while also gaining extra yards after the catch. Trying to Tame: Finding holes in Hock’s game is hard, but nitpickers are likely to point out his lack of high-end deep speed and suggest he add bulk to his near-perfect frame. The Take: The most pro-ready TE in this 2019 class, Hockenson is a special blocker and ascending red zone weapon. He may not be a metrics maven, but his versatility more than makes up for his not-quite elite athleticism. Fun Fact: His dedication to athletics extends beyond the field, as he has aspirations to eventually become an orthopedic surgeon. Claim to fame: Lighting fast, Fant is a hyper-athletic mismatch weapon who is deadly in the open field. An electric field stretcher, the 21 year old can run routes and adjust to the ball like a receiver. Trying to tame: His game (particularly in blocking technique) could do with some moxie, as his style isn’t terribly physical and lacks play strength at the point of attack. He’s additionally struggled with inconsistent hands (averaged 1 drop for every 7 catchable targets). The Take: If teammate T.J. Hockenson rumbles like a Jeep then Fant cruises like a Porsche Macan. A 94 percent SPARQ athlete, Fant is a fluid and fast move tight end with massive red zone potential (19 career touchdowns at Iowa). Fun Fact: His father, after whom he is named, played TE in the NFL for seven seasons and was selected by the New Orleans Saints in the first round of the 1993 NFL Draft. Claim to fame: Multifaceted player with diverse route knowledge, reliable hands, and elite run blocking ability. A disciplined runner after the catch, Smith additionally has the strength and balance to rack up YAC. Trying to tame: Undersized for the position (6-foot-2 and 242 pounds). Is missing a second gear. The Take: Tough and strong, Smith projects to be a reliable H-back at the next level. A well-rounded and versatile player with a high floor, Smith figures to be and early second round selection this spring. Which prospects intrigue you the most? Where would you like to see them land? Follow Liz on Twitter @LizLoza_FF and start a conversation.